The server from New Jersey will be able to buy plenty of pacifiers now. The days leading up to giving birth can be intense, especially for first-time parents. Sometimes, a little kindness can make all the difference for a busy mother-to-be. Courtney English works as a waitress at Lamp Post Diner in Clementon, New Jersey. She's been at the establishment on and off for two years and is used to being on her feet. But with a baby due April 1, waiting tables all day can get pretty tiring. "It is tough waitressing at this point, but I have a lot of help; my co-workers won't let me lift heavy trays, and they give me sections close to the kitchen," English told TODAY Food. "I have the greatest support from my co-workers and bosses." So, while carrying a baby, English also carries on her daily duties with a smile — saving all the money she can to help prepare for many expenses that come with having a child. On Friday, English served a new face among her tables of regulars: a local Voorhees County police officer. He had his meal, went to the counter to pay and left the restaurant. Later that day, when English went to collect her tips, she noticed a note written on the officer's check: "Enjoy your first. You will never forget it." Besides the thoughtful sentiment, the officer left a $100 tip ... on meal that was less than $9. "It was wonderful feeling, completely unexpected and genuine," English told TODAY. "Cops are portrayed as horrible people a lot of the time, and they aren't, and this just goes to show that a young officer [saw] a struggling mother-to-be and wanted to extend a little help!" English's father, Brian Cadigan, was also moved by the officer's gesture and posted what happened on Facebook — making a point to sharehow often police officers go above and beyond their daily responsibilities. "I don't know you Mr Police Officer, but you made my little girl cry, and made her year. Thank you, I always had the utmost respect for Officers, but you went above and beyond not just an officer, but a beautiful human being. God Bless," Cadigan wrote. His post has since garnered almost 10,000 reactions and over 3,400 shares. 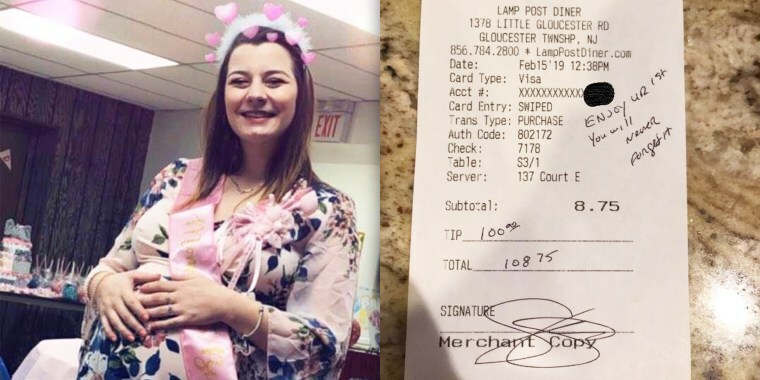 A statement from the Voorhees County Police Department confirmed it was indeed one of their officers who left English her tip; however, he now wishes to remain anonymous. Grateful for this truly random act of kindness, English told TODAY that she plans to use the extra cash on everyday items for the new baby like pacifiers, a blanket and washcloths.